This holiday season is going to be EPIC! How do I know it's going to be epic? 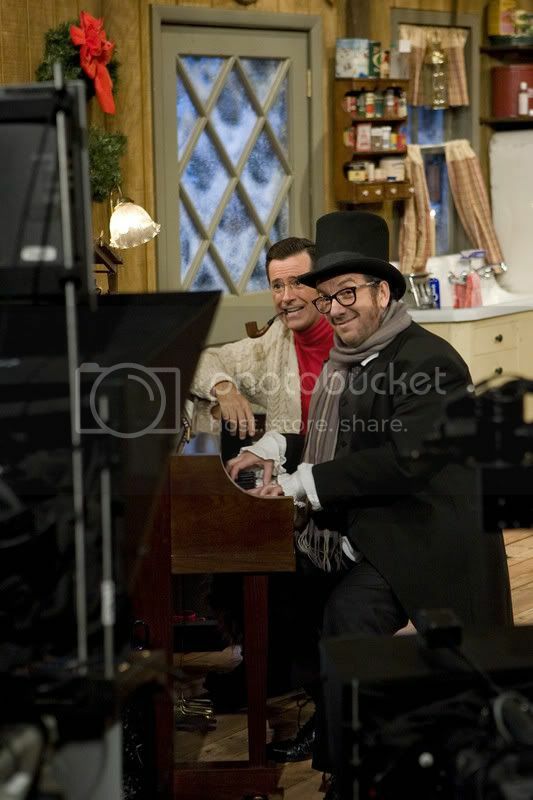 Because Stephen Colbert is doing a one hour Christmas special with all this awesome in it. And he's singing a duet with Jon Stewart omg! And since the Comedy Channel here have been soooo good with showing TDS/TCR just after they're broadcast in the US, I'm hoping they'll broadcast this too. No pic of Stephen and Jon sadly, but here, have one of Stephen with another one of his musical guests. I'm digging that pipe and the red turtleneck with cream cardigan combo. Lesser mortals would've looked ridiculous, but Stephen is rocking it. I love Comedy Central. At first it was full of it random stand-up and Whose Line is it Anyway?, which becomes terribly dull after three episodes, but right now the little channel is really bringing it. The Daily Show and Colbert Report combo is great. I love Stephen so much. I told you I sent him a letter asking him to prom senior year, right?